For the past year, I have spent my Friday’s as a volunteer at an Alzheimer’s Day Care Center. It’s called Trinity Place and is affiliated with my church. I started volunteering there because I was looking for a different kind of volunteer work, something fulfilling and engaging unlike anything I had done before. The experience met all of my expectations and was a spot of unique joy in my life. Then on January 20th, in a split second, my world changed when I fell and broke my patella. I’m looking at a 5-month recuperation so no more volunteering for a while. I’m missing my Alzheimer’s buddies and the staff who are so dedicated! I know when I return, they will have no recollection of me but that’s okay. We can rebuild and move forward. Let me introduce you to a few of my buddies. First, there’s Lucy who is slim, attractive, Hispanic and almost never smiles. But when she does, it’s a delight. She also never creates a problem, is fully functional and independent, attractive and neatly groomed. She is there but never calls attention to herself. Bertie is always laughing and smiling and loves to sing all the old songs, loves to eat and loves to play dominoes. She will always read aloud for devotional time and gets along with everyone. I can’t help but like her because my favorite grandmother’s nickname was Bertie. Then there’s Mildred who’s from New York and talks with that definable yankee nasal twang. She’s blunt and strong, stubborn and bossy but I like her immensely. She’s on a walker and her favorite line is “Okay, here we go” as she starts to propel her walker along. The staff have to remind her to be polite and to say “thank you” which she does with a look of surprise. Betty is beautiful, dresses so smartly and used to be a banking executive. I asked her daughter once why she was always dressed up, and she told me that each day she comes to the daycare believing that she is going to to the bank to work. That broke my heart but also warmed my soul! I miss their smiles, the funny comments they can make, and even their blank stares which hide full, productive lives. I hope they miss me! But in reality, since I have to regularly reintroduce myself each week, I know that my absence is not nearly as traumatic for them as it is for me. I wish my buddies well and hope to see them by summertime! If you’re looking for a rewarding volunteer experience, check around your community for a well-run Alzheimer’s DayCare. You won’t be sorry! 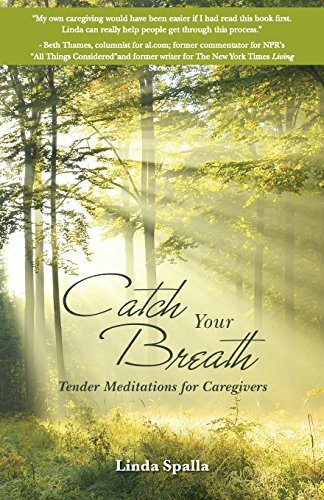 Linda has written a raw, honest series of meditations for caregivers based on her experiences in caring for her own mother. These will evoke both laughter and tears as they offer insight and courage to those caught in the caregiving web.